By time I was up and walking to work around 8 AM this morning in New York, the temperature was already 84 degrees and it’s forecast to hit a record-setting 102 degrees by 3 PM. The streets are a griddle, the offices are oppressive—more than usual—and I don’t even want to talk about the subways. Meteorologists are predicting that the entire East Coast will be trapped in suffocating heat for the rest of the week, thanks in part to a high-pressure area anchored off the Carolinas. It’s summer in the city, as the Lovin’ Spoonful would advise, so what do you expect? But every major heat wave—especially the ones that occur in New York and Washington, where apparently the only things that ever matter happen—brings global warming back into the equation. Al Gore seems a lot more reasonable when you’re sweltering in a 99 degree DC office building.Will blazing days like this one become the norm if we fail to curb carbon emissions? First of all, the usual caveat, which should be obvious but needs to be repeated: no single weather event can be said to be “caused” by climate change. Just as the record-breaking snowstorms of this past winter on East Coast didn’t disprove climate change, a record-breaking heat wave doesn’t seal the deal either. Weather and climate aren’t the same thing. To use a World Cup analogy (which allows me to link to more Lego football, this time in German), it’s as if the players on the soccer pitch represent the weather, and climate is the team manager. 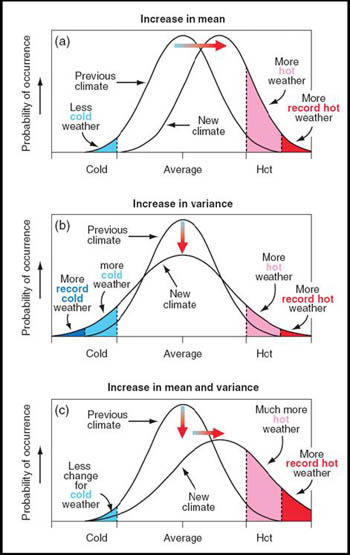 The day-by-day, week-by-week progress of weather is down to countless meteorological factors interacting—some in ways we can predict, others in ways we can’t. But climate sets the overall game plan—so some parts of the world will always be hotter or drier or wetter than others, just like the Germans will always be strong and efficient, the Dutch will be creative and the English will always be sad disappointments. And the extreme heat will wilt our crops. [David] Battisti and [Rosamond] Naylor looked at the effect that major heat waves have had on agriculture in the past — like the ruthless heat in Western Europe during the summer of 2003 — and found that crop yields have suffered deeply. In Italy, maize yields fell 36% in 2003, compared with the previous year, and in France they fell 30%. Similar effects were seen during a major heat wave in 1972, which decimated farms in the former Soviet Union, helping push grain prices to worryingly high levels. If those trends hold in the future, the researchers estimate that half the world’s population could face a climate-induced food crisis by 2100. Warmer winters won’t do us much good if we can’t feed ourselves while enjoying a balmy February. Something to think about during summer on Planet Earth.